Star Wars Battlefront Ultimate Edition will bundle up a small galaxy - or maybe a large star system - worth of multiplayer warfare next year. It will hit PS4 and Xbox One on November 18, just over a year after the game first came out, with the base game as well as the season pass all for $39.99, according to Amazon. The UK price is still TBA. 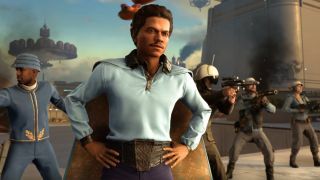 The Star Wars Battlefront Season Pass currently costs $49.99 by itself, which makes the Ultimate Edition a substantial discount for players who decide to jump on board the second time around. You won't be able to play every last map as soon as the Ultimate Edition comes out, though, since the Rogue One: Scarif DLC expansion will come out in December. The PS4 version of the Ultimate Edition will also include access to the Star Wars Battlefront Rogue One: X-wing VR Mission, same as the base game, though you'll need a PlayStation VR to play it. On the other hand, Star Wars Battlefront is coming to EA Access on Xbox One later this year, so subscribers to the Xbox-exclusive service won't even need to buy the game to play it. That should bring balance to the Force, right?